In selecting the talent, we look for individuals that have a natural analytical bent of mind, love numbers, and are able to connect the dots without requiring the full picture. We believe in hiring the best talent with strong pedigree. We hire employees from tier-1 MBA and Engineering institutes. TEG supports its clients in several business areas to accelerate the realization of actionable Business Insights using its 4th generation global delivery model. Analytics is no longer on the sidelines or the competitive advantage of large corporations. Companies of all sizes and Analytics maturity can benefit from the broad application of Analytics as long as they have fuel for the Analytics engine, the data. 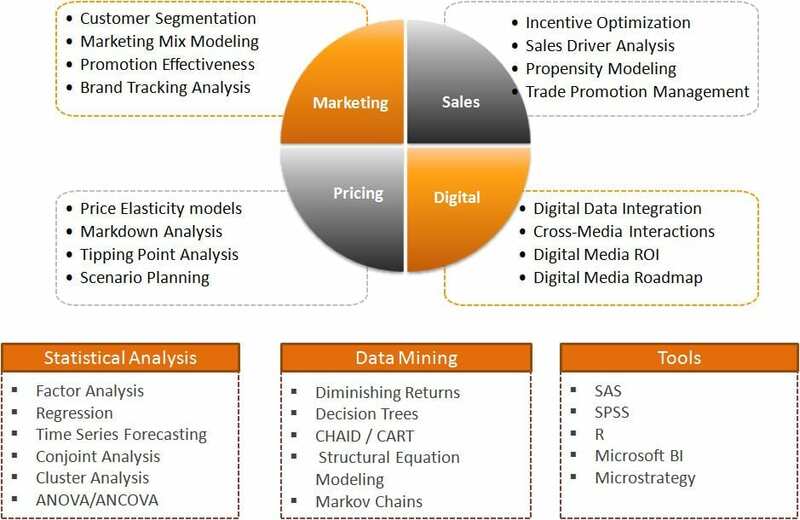 TEG delivers unique solutions for companies in the early stages of their Analytics journey to mature Analytics competitors. Early stage companies can get a quick start using our Hosted Analytics platform while mature customers can rely on our ability to partner with them on specific projects. We take pride in the fact that our services have delivered sustainable value to customers ranging from startup firms to fortune 500 companies.